Conservation Foundation of the Gulf Coast welcomes the Sarasota Nature Printers and their exhibit, sales, and demonstrations, "Art of Our Natural Environment." The opening reception and art sale will be held on Tuesday, March 19 at 5:30pm at the foundation’s headquarters at Bay Preserve, 400 Palmetto Avenue in Osprey. 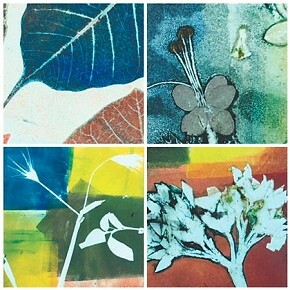 Sarasota Nature Printers employs an ancient art form, taking objects in nature and through a variety of techniques, transferring the beauty of those objects into art. Live demonstrations and sales at Bay Preserve will continue March 20 and 21, 10am to 4pm. Learn more or register for the reception and demonstrations at www.conservationfoundation.com/events or call 918•2100. Collage by JoAnn Migliore Campisi.